The first representation of Saint Valentine appeared in a The Nuremberg Chronicle, a great illustrated book printed in 1493. 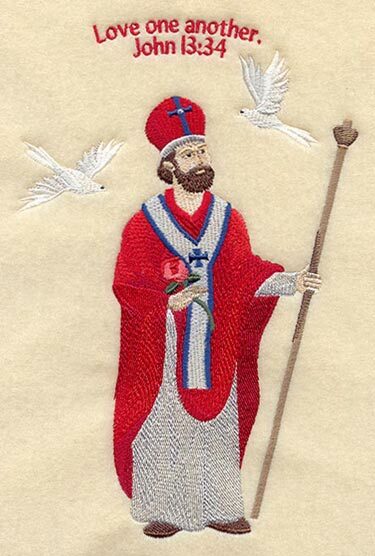 [Additional evidence that Valentine was a real person: archaeologists have unearthed a Roman catacomb and an ancient church dedicated to Saint Valentine.] Alongside a woodcut portrait of him, text states that Valentinus was a Roman priest martyred during the reign of Claudius the Goth [Claudius II]. 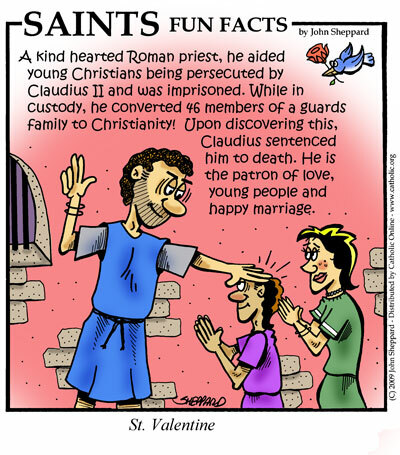 Since he was caught marrying Christian couples and aiding any Christians who were being persecuted under Emperor Claudius in Rome [when helping them was considered a crime], Valentinus was arrested and imprisoned. Claudius took a liking to this prisoner -- until Valentinus made a strategic error: he tried to convert the Emperor -- whereupon this priest was condemned to death. He was beaten with clubs and stoned; when that didn't do it, he was beheaded outside the Flaminian Gate [circa 269].